Pinterest, the estrogen-soaked corner of the internet that's home of close ups of suspenders being worn by skinny hipster grooms and interesting cake ideas, has been valued at 1.5 billion totally cute dollars, each of which has been fastened into a whimsical bow and affixed with twine to an ancient tree lining a very long driveway framing a shot of a departing old fashioned car with the words "JUST MARRIED" painted in the back window and several tin cans clanking along behind. The online pinboard just received another $100 million in financing from a venture capital investor, bringing its total estimated value up to about a billion and a half bucks. This comes on the heels of a meteoric rise for the site, which crossed the 20 million user mark this month — for some perspective, as of July 2011, the site only had 1 million users. That's a lot of adorable pictures of cupcakes and nursery decorating ideas and cute shoes. 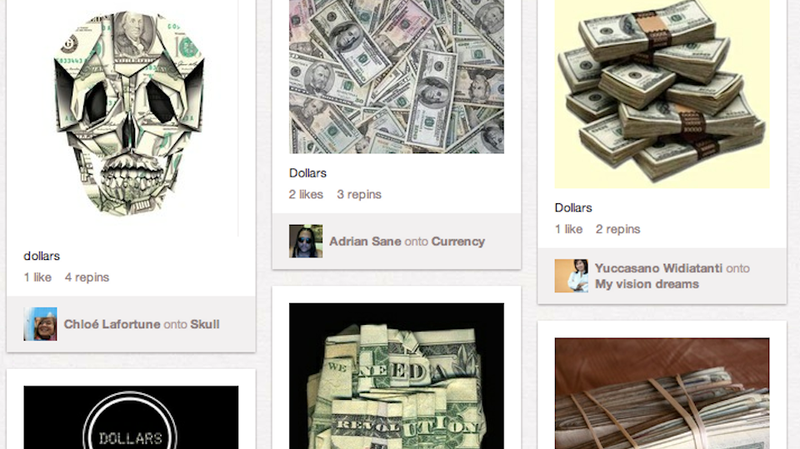 Pinterest execs hope this new infusion of cash will allow the company to increase its international presence. Now, let's proceed to the celebratory reception, which is being held in a barn with dozens and dozens of homemade paper lanterns being suspended from the ceiling. There will be square dancing, and long exposure shots of people holding sparklers.